One of the great things about taking a trip to Walt Disney World is that it truly does feel like you’re leaving the outside world behind to enter a place of magic and fantasy. If you play your cards right, you don’t even have to dine on any everyday food the entire time you’re there. But what if you do miss the comforts of home-cooked food once in a while? Where can you find that sort of thing once you’re in the “Disney bubble”? What if you’re visiting Disney Springs in particular? We’re here to help with that. In today’s article, we’re going to list 7 of the most mouthwatering comfort foods you can find in Disney Springs. There are many menu items at Wolfgang Puck Express that would fit the “comfort food” category. However, our money is on the half rotisserie chicken that’s topped with garlic butter and rosemary, then served with a side of mashed potatoes. For Disney Springs, it quite literally doesn’t get more “comfort food” than Chef Art Smith’s Homecomin’ restaurant. It’s practically the entire point of the place. You could close your eyes, point at something random on the menu, and what will arrive in front of you will be the epitome of down-home comfort food. 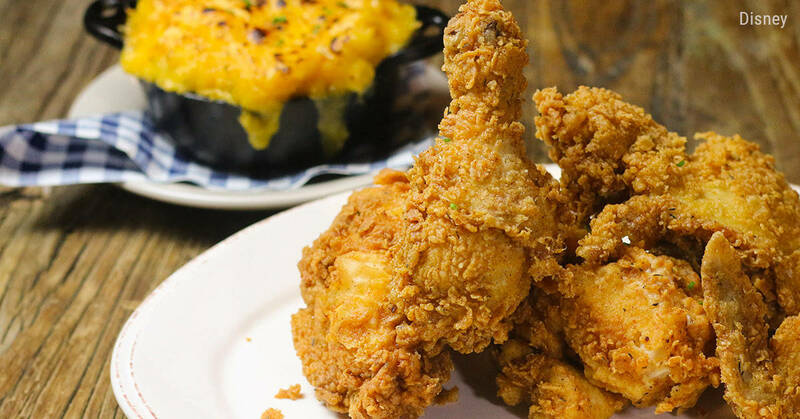 There is one dish though that stands above the rest: their fried chicken & doughnuts. 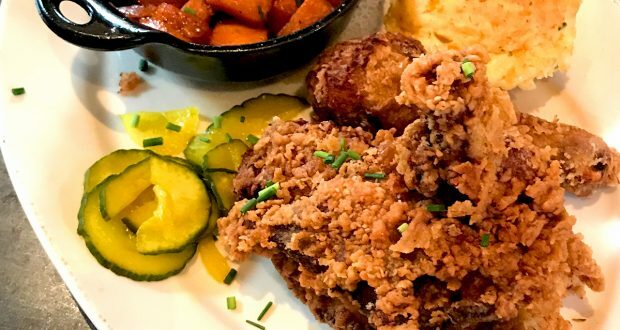 The chicken alone is worth the price of entry here, but add house-made sugar donutsto the affair, AND a little cast iron pot of creamy mashed potatoes? Boy, you can’t keep us away from this place when that kind of meal comes to the table. How can that combination not be delicious? At The Daily Poutine, you can have the classic version of poutine I just listed above, or you can venture into other combinations. For example, the “Italian Poutine” replaces cheese curds and brown gravy with mozzarella and bolognese sauce. 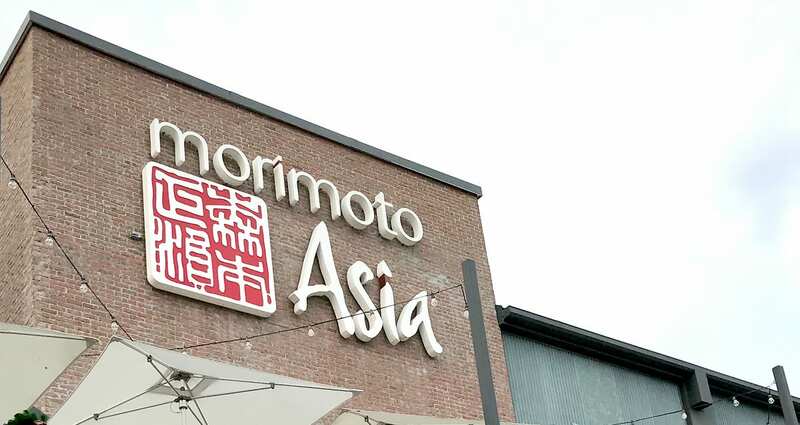 Venturing into the “comfort foods of the East” territory, we arrive at Morimoto Asia. 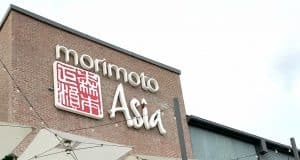 Here they serve up a variety of soups and noodles dishes—and plenty more things we won’t get into here today—that will fill your belly for sure, warming you from the inside every time. One dish in particular, the spicy pork ramen, is a perfect example of this. It offers roasted pork and egg noodles swimming in a soy flavored broth with a (just barely runny) soy-marinated egg and lots of scallions on top. Simply irresistable. If that’s not enough to satisfy you, add an order of their pork egg rolls on the side. These are heralded by many as the best egg rolls you’ll ever have. This steampunk-inspired restaurant doesn’t exactly give off the “comfort food” vibe of a place like Chef Art Smith’s Homecomin’, but they sure do know how to serve up their own spin on classic foods that will take you back to your childhood. Take their organic tomato soup and grilled cheese, for example. This is a much fancier version of the lunch your mom made you as a kid. The “gooey” in the name is well earned, with fourdifferent kinds of cheeses being melted on crunchy buttered sourdough bread to the point where they’re practically dripping off the side. The tomato soup has just a bit of a kick to it, creating the perfect counterpoint to all that dairy you’ll be consuming on the sandwich. 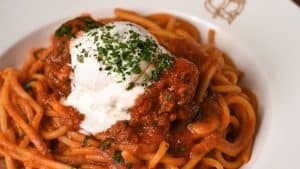 Maybe you’re of Italian descent and think you have to travel all the way to your grandmother’s home in the Old Country to experience the comforts of true Italian cuisine. Not so, mio amico.Stop in at Maria & Enzo’s Restaurante and order yourself some spaghetti and meatballs. Very traditional, very nostalgic, and most importantly, very tasty. Come on, what could be more comforting in one’s belly than pub food? At Raglan Road, you’ll get to experience a very Irish take on such things. Have a gander at the “Three Times a Boxty”, which they serve during brunch. It’s made up of two traditional Irish potato pancakes (that’s what “boxties” are) with sliced gammon meat and Dubliner cheddar sandwiched between them. A breakfast of champions, that.